Choc. macadamia nuts choc. 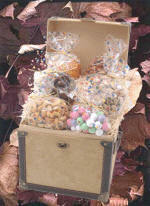 wafers, red biscuits, baguettes, roasted/salted cashews, roasted/salted pistachios, toffee peanuts, apricots, choc. malt balls, caramel pretzels, Dutch mints, choc. pretzels, white choc. almond clusters, milk choc. 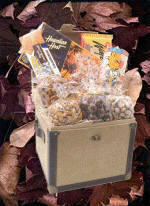 pecan clusters, praline popcorns, nacho chips, walnut cookies, roasted almonds, choc. espresso beans, choc. Jordan almonds, dark choc. orange peels. Choco macadamia nuts, choco wafers, red biscuits, baguettes, roasted/salted cashews, roasted/salted pistachios, toffee peanuts apricots, choco malt balls, caramel pretzels Dutch mints, choc. pretzels, white choco almond clusters milk choc. cashews clusters, nacho chips, praline popcorns. Choc. macadamia nuts choc. wafers red biscuits, baguettes, roasted/salted cashews, roasted/salted pistachios, toffee peanuts, apricots, choc. malt balls, caramel pretzels. Roasted/salted pistachios, roasted/salted cashews milk choc. almonds, apricots. Roasted/salted pistachios, roasted/salted cashews, milk choc. 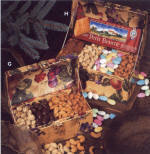 almonds toffee peanuts. 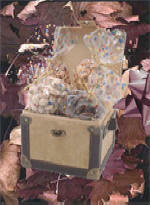 (G) Here is a lovely gift to which you can show your appreciation, without spending a lot of money. Open this compact attractive box and find salted California jumbo pistachios, sweet butter toffee peanuts, creamy milk chocolate almonds and roasted/salted delicious cashews. 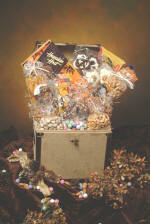 (H) This decorative gift box is larger and features assorted Jordan almonds, flavorful pistachios roasted and salted, sun-dried apricots, butter toffee peanuts and European imported biscuits. Caribbean cookies, red delicious apples, chocolate Macadamia nut clusters, jelly, Dutch mints, chocolate Jordan almonds, salted cashews and chocolate covered espresso beans. 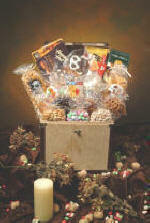 Included in this chest: red apples, salted cashews, summer sausage, gourmet mustard, chocolate Macadamia nut clusters, butter toffee peanuts, jelly, golden pears, caramel pretzels, gourmet cheese, pistachios and exotic Caribbean cookies. 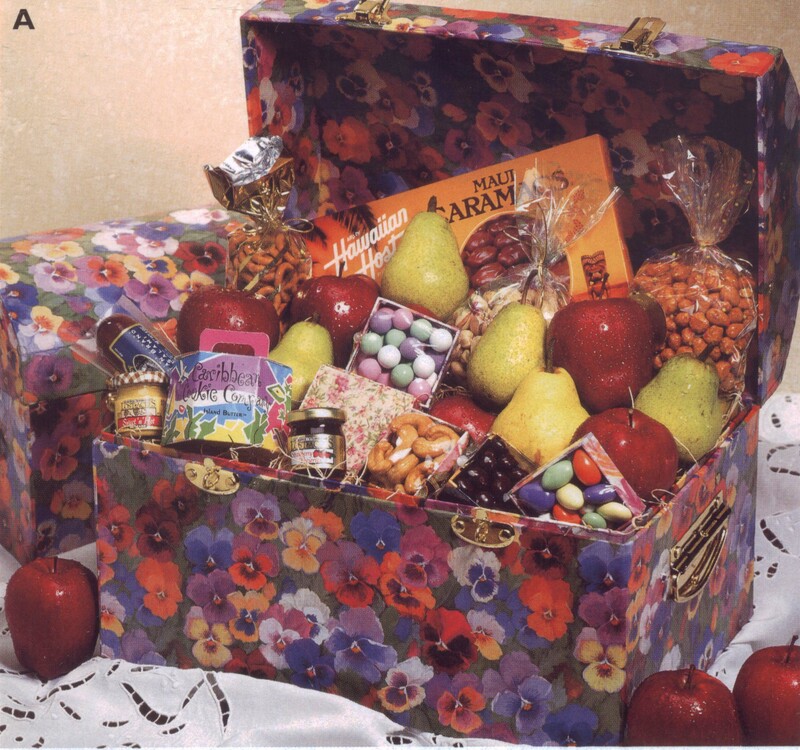 Included in this chest: summer sausage, gourmet mustard, golden pears, pistachios, caramel pretzels, cheese, butter toffee peanuts, apples and exotic Caribbean cookies. 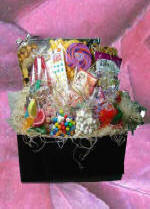 Lollypop, cheese popcorn, candy buttons, chocolate bar Elite, Peanut butter pretzels, sour belts, salted pretzels, red licorice sticks, jelly beans, Swedish fish, sour spanks assorted chocolate hard candy by Go Lightly, fruit slices, strawberry puffs, jawbreakers, salt water toffee, bubblegum, fruit flavored toffee.